Of all the animal encounters across the globe, trekking through the Ugandan jungle to catch a glimpse of the rare mountain gorilla is considered one of the most memorable. Many travelers have considered it a life-changing experience that left them in pure awe. There are less than 900 mountain gorillas in the world, and they can only survive in the wild. They inhabit areas of Uganda, Rwanda, and the Democratic Republic of Congo. If you wish to gaze upon these magnificent creatures, consider a trip to Uganda, where most of them reside. Bwindi Impenetrable Forest National Park, known as “The Place of Darkness” due to the thick treetops overhead, is a UNESCO World Heritage Site with a diverse ecosystem and various endangered animals. Bwindi alone is home to over half of the mountain gorilla population and is the premiere destination for a gorilla encounter. It’s important to note that a trip here is no walk in the park. The terrain is challenging and involves guides cutting through dense bush to find the gorillas, who are constantly on the move. Due to steep permit prices and trekking guidelines, it’s advised to travel through a tour company. All the elephant lovers out there should consider Sri Lanka for their next vacation. This beautiful country is one of the best places to get to know these gentle giants. Elephants reside in over 15 national parks, and each park offers something unique. Minneriya National Park is a top choice of many travelers due to its large elephant population. It’s not unusual to see up to 200 elephants at once! The only downside to Minneriya is it can be busy—its popularity means you’ll often have to wait in long lines of safari trucks, and you’re unlikely to find solitude. Head to Yala National Park if you want to see more than just elephants; the park is home to leopards, too. Both animals are easier to spot at sunrise, and the elephants tend to stay in smaller groups. Kadulla National Park is another exciting option. It’s home to over 250 elephants who roam free and often travel between Kadulla and Minneriya. Udawalawe National Park is known for its diverse wildlife and elephant sanctuary. The sanctuary works to rehabilitate orphaned elephants, with the aim of releasing them back into the wild. This is the perfect destination for those looking for all kinds of animal encounters. An African safari is the most obvious choice when seeking animal encounters, but its popularity is well-deserved. 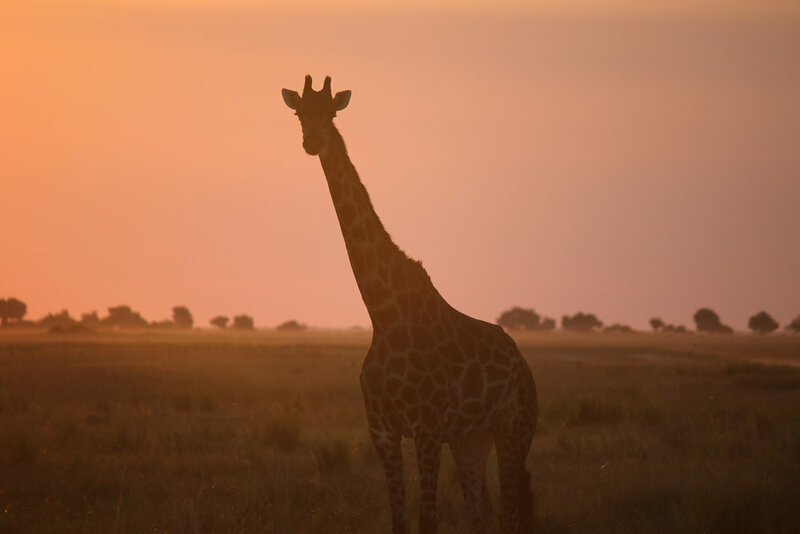 There’s something magical about watching these fascinating animals, from elegant giraffes to formidable lions, roaming through their natural habitat. With so many places to go and kinds of safaris to choose from, it’s easy to customize your experience. Botswana is a beloved destination with impressive options. Here you’ll find the Okavango Delta, Savuti Marsh, and Chobe National Park. The Okavango Delta is an expansive wetland system with incredible game and birdlife. Canoe through the channels, keeping an eye out for hippos, lions, and zebras. Savuti Marsh is a large inland lake fed by the Savuti Channel. If you want to immerse yourself deep in nature, this is your spot; the region is fairly inaccessible, so you’ll really get a feel of the animals’ habitat. Chobe National Park is home to over 500 elephants, thousands of buffalo, and countless other species. Choose between a classic safari drive, night drive, self-drive, or river cruise—all spectacular ways to experience the land. Tanzania is another prominent location for an African safari. Here you’ll find the famous Serengeti, where over 1.2 million wildebeests take part in the Great Migration. This UNESCO World Heritage Site has over 70 kinds of large mammals and 500 species of birds, and you’ll easily spot The Big Five. There are numerous unforgettable sites within the region, such as Tarangire National Park, Great Rift Valley, Lake Manyara National Park, and Ngorongoro Crater. Anyone who’s been to the Galapagos Islands will tell you there are sea lions at every turn. These adorable creatures call the islands home and love to lounge in the sun, beg the fishermen for snacks, and swim with tourists in the crystal-clear waters. When on land, people are required to stay 10 feet away from sea lions; although you’ll feel the urge to cuddle them, they are still wild animals, and the rules are in place for protection. However, tourists who embark on snorkeling adventures are likely to have these inquisitive creatures dart right over to play. While you shouldn’t reach out and touch them, it’s okay to let them come to you. Playful and mischievous, sea lions have a temperament similar to puppies and are known for nudging boats, nipping flippers, and swimming in circles around snorkelers. For many, swimming with frisky sea lions is the highlight of traveling to the breathtaking Galapagos Islands. Wildlife Safaris From luxury lodging to camping experiences, we curate sustainable & positive encounters with wildlife across the globe. Patagonia, an enigmatic region shared by Chile and Argentina, encompassing the southern Andes and recognized for its stunning landscapes and vast array of wildlife. It is the prime location for more adventurous explorers to track majestic pumas, gaze at the gargantuan condor soaring through the mountains, and look out for the 500+ species that roam this spectacular area. Some wildlife spotting is almost guaranteed wherever you go, such as guanacos and endemic birds like hawks and eagles, but some species will require more specific locations if you hope to catch a glimpse of them. Here’s a guide to some of the wildlife that (fingers crossed) you’ll be lucky enough to see on your visit to Patagonia. Always wanted to wake up to the mighty roar of a lion? Get transported into The Lion King? Kenya is the most popular safari destination in all of Africa. This beautiful country in the East of Africa is filled with 61 Kenya National Parks and National Reserves, covering 8% of the land. The difference between a park and a reserve is that parks only allow tourism and research while reserves allow for human activities such as firewood collection or fishing under specific regulated conditions. Nestled in East Africa, in the Southwestern portion of Kenya that borders Tanzania’s Serengeti National Park, the Masai Mara National Reserve (also known as the Maasai Mara) is Kenya’s most famous wildlife destination. The reserve is one of Africa’s highest density regions for predators, and its wide open grasslands and rising wildlife populations make it one of the best (and easiest) places in the world to spot game. Teeming with wildlife such as zebra herds, wildebeests and springboks, Namibia is a wildlife lover’s paradise. Situated in southern Africa, this country might very well be one of the most underrated places to visit. If you love wildlife, nature, culture and adventure, here are the best things to do in Namibia. What images come to mind when you hear the word “safari?” Most likely, your head immediately fills with scenes from the Lion King: majestic lions strolling through the tall, golden savanna and cheetahs chasing their prey at lightning speeds, all the while birds soar towards the giant, fiery sunset. But that’s just the movies, right? Real life hardly ever lives up to what we picture in our minds. Well, what if we told you that the iconic safari experience is real? Keep reading below to find out what to really expect from a classic safari in the beautiful African country of Namibia. Sri Lanka truly has something for everyone, from its laid-back beach towns, to historical ruins, to tea estates to hiking up mountain peaks. Voted top country for travel in 2019 by Lonely Planet, go before the tourism surge. Here are ten reasons to visit Sri Lanka.